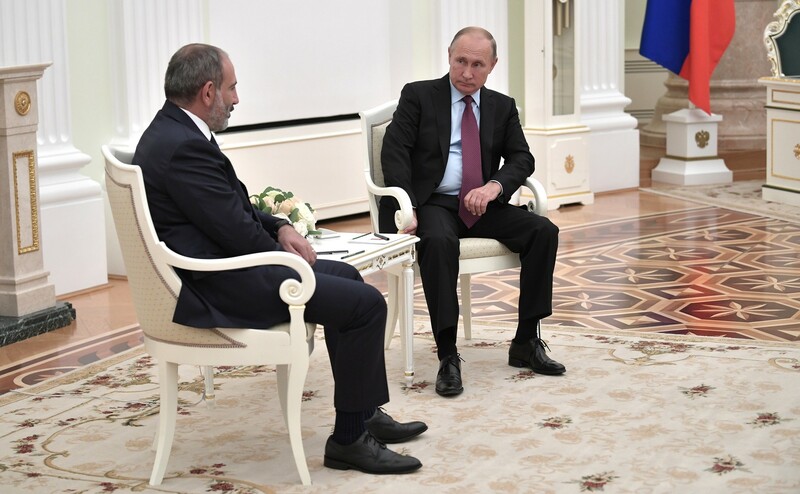 Armenian Prime Minister Nikol Pashinyan visited Moscow on September 8 for his third meeting with Russian President Vladimir Putin in the last four months. Pashinyan said the frequency of the meetings testified to the strength of the relationship, but he also tangled with a prominent Armenian-Russian businessman and philanthropist who accused Armenia's new leadership of damaging the country's investment climate. The Armenia-Russia relationship is in a turbulent phase, as the Kremlin mistrusts the new leadership in Yerevan, which is populated by many pro-Western liberals. Sharpening Russian concerns are the criminal charges that Armenian investigators have filed against Yuri Khachaturov, the current general secretary of the Collective Security Treaty Organization, a Russia-led military bloc, for his role in the violent crackdown against protesters in Yerevan in 2008. Prosecutors also have filed charges against former defense minister Mikael Harutyunyan, and Russia has refused to extradite him. Nevertheless, the official part of Pashinyan's Moscow visit appears to have gone smoothly. “We didn't discuss private issues,” Pashinyan told journalists after the meeting with Putin, when asked about the Harutyunyan case. “I think it's a matter of further cooperation between the Armenian and Russian law enforcement agencies." At issue was the new government's closure of the Center for Strategic Initiatives, a government-run effort to attract foreign investment that opened in 2016 and with which Vardanyan has worked. "My friends and I have invested more than $600 million in Armenia over the past 18 years. It's not a small amount. Do whatever you want. I just think you need to maintain dialogue,” Vardanyan said at the meeting with Pashinyan. “You have the right to do whatever you want with your organization, but if it’s created jointly with the private sector, and you do not even ask before closing it, but you notify us. To say the least this is disrespectful." Vardanyan also asked Pashinyan if he could guarantee “predictability” for business in Armenia, and Pashinyan fired back. "Now, different people, the press, talk about instability, civil war, I don’t understand. Today, the government in Armenia belongs to the people and it will always be that way. You want me to announce myself a lifelong monarch, so you could say there is a stability. It won’t happen." Vardanyan is well known in Armenia for his philanthropic work. He founded the IDeA foundation, which conducts development projects and holds the the high-profile Aurora Prize awards. He is also a founder of the United World College in Dilijan, an elite school. He also has relationships with the leaders that Pashinyan ousted, including Karapetyan and former president Serzh Sargsyan. In 2016, two Russian State Duma candidates of Armenian origin, Semyon Bagdasarov and Roman Babayan, received support from Armenia’s Presidential administration, Babayan's campaign manager told Eurasianet. The Babayan campaign official said that at the request of the Sargsyan administration, both campaigns were funded by Russian-Armenian businessmen, including Ruben Vardanyan. Vardanyan also is an investor in Lydian International, the company involved in the controversial Amulsar gold mining project. Vardanyan's interests aside, official Armenian state statistics have indicated that foreign direct investment in the second trimester of 2018 – roughly coinciding with Pashinyan's time in office – is down 43.5 percent over the same period the year before. With reporting by Grigor Atanesian. Ani Mejlumyan is a journalist based in Yerevan. Grigor Atanesian is a freelance journalist who covers Armenia.